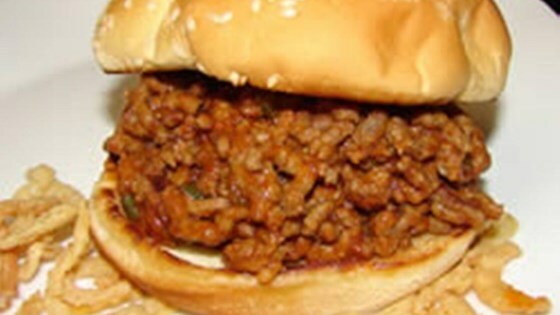 "This my personal sloppy joe recipe. I have tweaked it to have all my favorite ingredients. Not one of them overpowers the other. I hope you like it, as it makes a great lunch or game-day sandwich for the family. I generally serve it on a better quality hamburger bun with Kettle® potato chips." Heat a large skillet over medium-high heat. Add beef to the skillet and break into smaller bits with a spatula as it cooks; cook until browned on one side, 3 to 5 minutes. Turn beef and add onion, bell pepper, and celery. Put a cover on the skillet and continue to cook until beef is completely browned and crumbly, 2 to 5 minutes more. Stir vinegar, mustard, brown sugar, Worcestershire sauce, and garlic powder into the beef mixture; season with salt and pepper. Reduce heat to low and simmer mixture, stirring occasionally, until vegetables are completely tender, about 15 minutes. See how to make an All-American classic! You can make 4 large or 6 medium-sized sandwiches from this recipe. This recipe also freezes well. I use a vacuum-sealed bag for individual portions when I want a fast meal. This is terrible. Not enough sauce for the amount of meat. The sauce is not even a little sloppy joe-like. Added bbq, salsa, and cholula.